I Love Paris is a wonderful, sweet tribute to the outstanding work of Cole Porter. 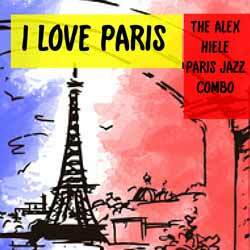 Here, The Alex Hiele Paris Jazz Combo take 10 Cole Porter numbers and translate them into catchy instrumental Jazz tracks. There wasn't a track on this release that I didn't like, but I totally loved the closing piano part for 'I've Got You Under My Skin'. It will probably pass most by, but for some reason it really stayed with me. If you're a fan of Porter's work then you'll want to listen to this to hear some of the classics in a new light. And, if you're a Jazz collector then this will add another flavour to your music library. Hiele has managed to turn in a beautiful reworking of some outstandingly memorable songs.